Purpose: This study aims to determine the prevalence, pattern, and time of presentation for the ocular disorders seen among children attending a pediatric eye clinic in Nigeria. Materials and Methods: A retrospective chart review of all first-time patients at a pediatric eye clinic, within 2005–2007 was carried out. Data on cohort demographics, duration of illness before the presentation, and types of ocular disorders were collected and analyzed. Statistical significance was indicated by P < 0.05. Results: A total of 335 cases were reviewed, comprising 171 males and 164 females. The majority of children were in the 10–14 age group (31.94%). Allergies (40.72%) were the most common ocular disorder followed by refractive errors (22.16%), trauma (7.98%), and inflammation/infections (7.98%). Among others, ocular disorders seen in decreasing frequency were ocular motility imbalance (5.41%), tumors (1.28%), and ptosis (0.77%). Least common was juvenile glaucoma (0.51%). Majority (42.09%) presented more than 1 year after onset of illness while only 16.2% presented within 1 month of their illness. Conclusion: Most common causes of ocular disorder in this study were allergy, refractive error, and trauma. Majority of the children presented late, and most of the disorders can result in visual impairment/blindness if not treated early. This emphasizes the need for appropriate health education to avert most cases of childhood blindness/visual impairment. Ocular morbidity in childhood is an important cause of medical consultation. If not attended to, it can lead to varying degrees of visual impairment which is unequally distributed globally with more than 90% of visually impaired people living in the developing countries. Children below 15 years constitute about 44% of the Nigerian population and these are our future leaders. Investing in the prevention and treatment of their ocular health problems will reduce the economic and social burden characteristic of late intervention. Early diagnosis and treatment are therefore important in maintaining a child's eye health in our environment. In developing countries such as ours, 60% of these children die within 1 year of going blind. Pediatric ocular disorders, even as trivial as allergic conjunctivitis, if improperly managed, can lead to blindness. To achieve early diagnosis, it is important to determine the types of ocular disorders prevalent, and sociodemographic characteristics. Ocular disorders along with allergies and asthma were considered the most common long-term health problem experienced by children in Australia. Spectrum of pediatric ocular disorders varies by region worldwide. In Nigeria, various studies,,, have been carried out to determine the pattern and prevalence of ocular disorders in children. In Ibadan, South West Nigeria, refractive errors (25.7%), vernal conjunctivitis (25.3%), eye injuries (13.3%), and corneal inflammation (12.5%) were the leading causes of childhood eye morbidity reported over 20 years ago. A more recent study also in South West, Nigeria reported ocular injuries as the most common disorders seen (21.7%), followed by allergic conjunctivitis (17.8%), infection of the eye and its adnexa (15.4%), and refractive errors (14.3%). In South East Nigeria, vernal conjunctivitis, followed by refractive error and subconjunctival hemorrhage were the most common ocular disorders identified while refractive error was the most common in another study in Enugu Nigeria. Abah et al. in Zaria, Northern Nigeria found in descending order of frequency, refractive error, allergic conjunctivitis, glaucoma suspect, and color deficiency as causes of childhood eye morbidity while Kehinde et al. also in Northern Nigeria found allergic conjunctivitis, refractive error, and infective conjunctivitis. In Ethiopia, North Africa, main disorders seen in a tertiary center were conjunctivitis, trauma, refractive error, and trachoma. In Australia, pediatric ocular disorders include refractive errors, congenital anomalies including cataract and glaucoma, allergies, retinal disorders, among others and are either treatable or preventable. Developing eye care programs targeting children is different from programs targeting adults, as the primary decision maker in the case of children with ocular disorders is often not the subject with the problem. The changing trend in the ocular disorders of children implies that regular review of the causes should be determined to plan effectively for maintaining the eye health of children. This study aims to determine the prevalence, pattern, and time of presentation for the ocular disorders seen among the children attending the pediatric eye clinic in Enugu, South East Nigeria, and the findings can be utilized in the planning and development of childhood eye care program for the prevention of avoidable blindness and visual impairment. University of Nigeria Teaching Hospital (UNTH), Enugu is a teaching hospital located in the heart of Enugu metropolis and serves as a referral center for all the primary and secondary health care facilities from within the state and the adjoining states. It is the first teaching and tertiary hospital in Southeastern Nigeria and has specialists in the different disciplines in medicine. It also offers primary and secondary eye care to walk in (self-reporting) patients. The pediatric eye clinic runs once weekly. It is manned by a consultant ophthalmologist who supervises the residents posted to the unit. Every new patient attending the clinic is reviewed by the consultant ophthalmologist who subjects the patients to examination and relevant investigations before a definitive diagnosis is made. This was a retrospective survey of the available records of children who presented for the first time to the pediatric eye clinic for the first 3 years after the inception of the clinic (2005–2007). Fourteen files were excluded from the study due to incomplete significant data. Exclusion criterion was incomplete data. The inclusion criterion was the presence of full data including diagnosis. The initial diagnosis was accepted as disorder. Any new disorder arising during hospital subsequent visits was ignored. All the patients aged 0–16 years who presented during survey either as a self-reporting patient or referred patient and seen by the consultant ophthalmologist and residents under the direct supervision of the consultant. Data were collected by the authors from the records in the case files of the children who attended the eye clinic during the study after obtaining the relevant clearance from the institution. Information was retrieved by the authors on the age of the patients at presentation, gender distribution of the children, duration of illness before the presentation, and types of ocular disorders. Files with incomplete data were not included in the study. Data were analyzed using the Statistical Package of the Social Science software for Windows, version 16.0. Chicago, USA, SPSS Inc. and presented in tables. P < 0.05% was considered statistically significant. Ethical clearance was obtained from the Ethics and Research Committee of UNTH, Enugu. A total of 349 children were seen in the clinic during the study. Of these, fourteen had incomplete information in their case files and were excluded. The records of the remaining 335 children were evaluated. There were 171 (51.0%) males and 164 (49.0%) females with a male to female ratio of 1.04:1. The mean age for males was 7.9 ± 4.96 standard deviation (SD), while the mean age for females was 8.46 years ± 4.18 SD. Majority (31.94%) of the children were in the 10–14 years age group followed by the 5–9 years age group [Table 1]. At a prevalence of 40.72%, allergies were the most common ocular disorder noted followed by refractive error (22.16%). Congenital anomalies (8.24%) with congenital cataract topping the list were a significant cause of ocular ailment. The most common form of ocular motility imbalance was esotropia. Blunt trauma with or without hyphema (5.15%) was the most common form of trauma seen followed by penetrating injuries (1.80%) and superficial foreign body (0.77%) [Table 2]. Chemical injuries from unorthodox medicine (traditional eye medication) constituted the least (0.25%). Under the category of others included conjunctival nevus (0.25%), malingering (0.77%), amblyopia (0.77%), retinitis pigmentosa (0.51%), cortical blindness (0.51%), and asthenopia. Top on the list for congenital disorders was cataract (3.60%) followed by nasolacrimal duct obstruction (1.03%). The following ocular disorders were statistically related to age: congenital anomalies (P = 0.000), refractive error (P = 0.000) while allergies (P = 0.870), trauma (P = 0.445), tumors (P = 0.233), infections/inflammations (P = 0.292), ocular motility imbalance (P = 0.675), ptosis (P = 0.393), bilateral corneal opacities (P = 0.758), and juvenile glaucoma (P = 0.177) were not statistically related to age at P < 0.05 [Table 3]. 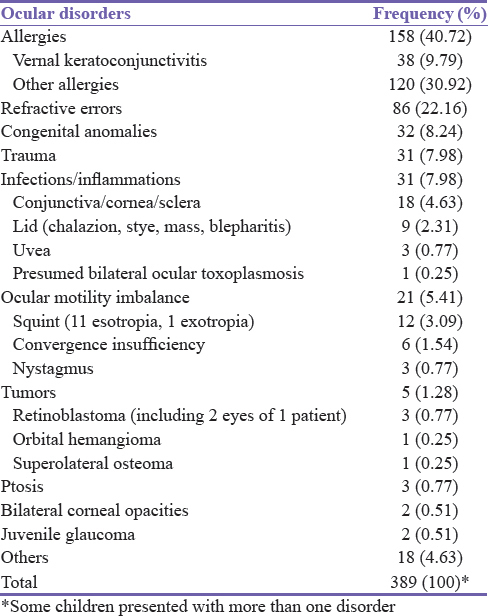 Almost half (42.09%) of all the children presented more than a year after the onset of the ocular ailment [Table 4]. Majority of the children (31.94%) were in the 10–14 age group followed by 5–9 age group (30.15%). This corroborates the findings in other studies.,,,,, This is the age group which can convincingly report any ocular symptom to their parents or caregivers. Younger children are hardly taken seriously when they complain of ocular problems, and so they usually do not present early to the eye clinics. Allergies (40.72%) followed by refractive errors (22.16%) were the most common ocular disorders noted in this study. Other studies,, at 40% and 35.6% and 48.1%, respectively, also reported allergies as the most common ocular disorder with refractive error second. Lower values were noted in some studies,, that also had allergies as the most common ocular disorder. The studies carried out in South East Nigeria, were also similar in the pattern reported, contrary to the findings in the Southwestern, part of the country and in other African countries. The different ethnic groups and geographical zones may be responsible for this difference. Allergies can result in visual impairment and poor performance in school from the resulting discomfort especially vernal keratoconjunctivitis which was present in 9.79% of the children. Males (54.4%) were predominantly affected similar to other studies but there was no statistically significant relationship between allergies and age even though it occurred predominantly in the 10–14 and 5–9 age groups as expected. Refractive errors are a significant cause of visual impairment in children and can result to amblyopia if left untreated. According to the WHO, uncorrected refractive errors account for 43% of visual impairment globally and 12 million children are visually impaired due to refractive errors. This number cannot be ignored as children need vision for social and educational development. Three (0.77%) of the children in the study were already being treated for amblyopia. Refractive error which occurred more in the 10–14 years age group was significantly related to age. The prevalence in our study, however, is much higher than the WHO range of 2%–10% and the values from other studies,, The high value in our study may be as a result of the study methodology. This is a hospital-based study, and so most of the respondents were people who had symptoms and could articulate it as depicted by the age group with the highest prevalence. Trauma, another significant source of ocular morbidity, and blindness, was noted among (31) 7.98% of the children. Other studies,, with slightly higher values 13.5%, 11.4%, 13.8%, respectively, also reported trauma as the third most common disorder. All these studies were hospital based and this may account for the similarity. The authors, that reported trauma as the first and second most common ocular disorder believe that the agrarian nature of their study community may have influenced their result. Blunt ocular injuries (5.15%) similar to other studies,, accounted for most of the trauma. Others reported penetrating injuries as the most common type of injury. Children are prone to trauma especially when they play unsupervised at home or in schools.,, Regular targeted education is necessary in schools and through the media to discourage rough play among children as well as encourage adult supervision. 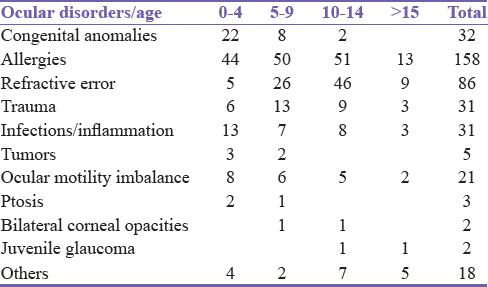 Thirty-two (8.24%) of the ocular disorders were congenital anomalies, and these were statistically associated with age with most of the disorders occurring in the preschool age as in a similar hospital-based study. Congenital cataract and glaucoma are causes of childhood blindness worldwide but particularly in low-income countries. Early and specialized treatment is required to minimize the socioeconomic burden of these causes of blindness especially as the affected children require lifelong management. Ptosis in moderate to severe degrees can result in stimulus deprivation or anisometropic amblyopia and ultimately affect the quality of life of a child if not adequately managed early. Similar to other clinic-based study in Nigeria, 3 (0.77%) of these children had ptosis. Infections and inflammations accounted for 7.98% of ocular disorders. Ocular infections/inflammations are easily treatable with antibiotics and anti-inflammatory agents without adverse complications, however, it has been reported that patients in developing countries resort to using transmission electron microscopes (TEM) in the treatment of these disorders, an attitude that has been attributed to poverty, ignorance, and inaccessibility to orthodox eye care. Only one child (0.25%) was noted to have used TEM in this study. The low incidence may be due to the fact that the study was carried out in a tertiary hospital located in a city. The majority (42.09%) of the children presented to the clinic more than a year after the onset of their illness. Of these, 37 (11.04%) presented within 1 week and only 2 (0.60%) within 1 day of onset of their illness. Late presentation to the eye clinic has been reported in other studies. In addition, the older age group (10–14 years) were highly represented in this study. This is a reflection of the consultation pattern of the respondents and corroborates the finding that the more articulate older children are more likely to draw attention to their symptoms. This finding was also reported in other studies., The need for early presentation and treatment cannot be overemphasized in the management of childhood ocular disorders as the causes of childhood blindness, amenable to prevention and treatment, can have devastating consequences if not addressed. The most common causes of ocular disorders in this study were allergy (40.72%), refractive error (22.16%), and trauma (7.98%). This finding corroborates previous studies. In addition, majority (42.09%) of the children presented more than a year after the onset of their illness. These ocular disorders can result in visual impairment and blindness if not treated timely. Appropriate health education emphasizing early presentation and timely intervention are requisite factors in planning programs for the prevention of childhood blindness and visual impairment in the country. Health education should also target parents and caregivers concerning safe play among children to avoid trauma and focus toward allergic eye disease. Visual Impairment and Blindness Fact Sheet No. 282; June, 2012. Available from: http://www.who.int/mediacentre/factsheets/fs282/. [Last accessed on 2015 June 20]. Population Division of the Economic and Social affairs of the United Nations Secretariat. World Population Prospects: The 2012 Revision. Available from: https://en.wikipedia.org/wiki/Demographics_of_Nigeria. [Last accessed on 2016 Dec 12]. World Health Organization. Action plan 2006-2011. (WHA 59.25; Geneva). Available from: www.who.int/blindness/Vision2020_report.pdfpage21.Childhoodblindness. Eye Health among Australian Children. Cat. No. PHE 105. Canberra: Australian Institute of Health and Welfare (AIHW); 2008. Available from: http://www.aihw.gov.au. [Last accessed on 2016 Dec 12]. Abah ER, Oladigbolu KK, Samaila E, Gani-Ikilama A. Ocular disorders in children in Zaria children's school. Niger J Clin Pract 2011;14:473-6. Onakpoya OH, AdeoyeAO. Childhood eye diseases in South Western Nigeria. Med J Sao Paulo 2009;64:947-51. Onyekonwu GC. Pattern of eye diseases in Nigerian children seen at Ebonyi State University Teaching Hospital (EBSUTH), Abakaliki, Nigeria. Ebonyi Med J 2008;7:4-7. Ajaiyeoba AI, Isawumi MA, Adeoye AO, OluleyeTS. Prevalence and causes of eye diseases amongst students in South-western Nigeria. Ann Afr Med 2006;5:197-203. Ajaiyeoba A. Childhood eye diseases in Ibadan. Afr J Med Med Sci 1994;23:227-31. Okoye O, Umeh RE, Ezepue FU. Prevalence of eye diseases among school children in a rural South-eastern Nigerian community. Rural Remote Health 2013;13:2357. Nkanga DN, Dolin P. School vision screening programme in Enugu, Nigeria: Assessment of referral criteria for error of refraction. Niger J Ophthalmol 1997;5:34-40. Kehinde AV, Ogwurike SC, Eruchalu UV, Pam V, Samaila E. School eye health screening in Kaduna – Northern Nigeria. Niger J Surg Res 2005;7:191-4. Demissie BS, Demissie ES. Patterns of eye diseases in children visiting a tertiary teaching hospital: South-western Ethiopia. Ethiop J Health Sci 2014;24:69-74. Jose R, Sachdeva S. School eye screening and the National Program for Control of Blindness. Indian Pediatr 2009;46:205-8. Mehari ZA. Pattern of childhood ocular morbidity in rural eye hospital, Central Ethiopia. BMC Ophthalmol 2014;14:50. Salman MS. Pediatric eye diseases among children attending outpatient eye department of Tikrit teaching hospital. Tikrit J Pharm Sci 2010;7:95-103. Sethi S, Sethi MJ, Saeed N, Kundi NK. Pattern of common eye diseases in children attending outpatient eye department Khyber teaching hospital. Pak J Ophthalmol 2008;24:166-70. Bekibele CO, Olusanya BA. Chronic allergic conjunctivitis: An evaluation of environmental risk factors. Asian J Ophthalmol 2006;8:147-50. Ayanniyi A, Mahmoud AO, Olatunji FO. Causes and prevalence of ocular morbidity among primary school children in Ilorin, Nigeria. Niger J Clin Pract 2010;13:248-53. Niiranem M, Ratvio I. Eye injuries in children. Br J Ophthalmol 1981;65:436-8. World Health Organization. Causes of Childhood blindness and current controlmeasures. Vol. 1992. WHO; Geneva: Prevention of Childhood Blindness; p. 21-2. Ashaye AO. Eye injuries in children and adolescents: A report of 205 cases. J Natl Med Assoc 2009;101:51-6. Nwosu SN. Domestic ocular and adnexal injuries in Nigerians. West Afr J Med 1995;14:137-40. Adeoye AO. Eye injuries in the young in Ile-Ife, Nigeria. Niger J Med 2002;11:26-9. Birch EE, Stager DR. Monocular acuity and stereopsis in infantile esotropia. Invest Ophthalmol Vis Sci 1985;26:1624-30. Dickey CF, Metz HS, Stewart SA, Scott WE. The diagnosis of amblyopia in cross-fixation. J Pediatr Ophthalmol Strabismus 1991;28:171-5. Courtright P, Lewallen S, Kanjaloti S. Changing patterns of corneal disease and associated vision loss at a rural African hospital following a training programme for traditional healers. Br J Ophthalmol 1996;80:694-7.
WHO. Prevention of Blindness and Visual Impairment. Available from: http://www.who.int/blindness/causes/priority/en//index4.[html/. [Last accessed on 2017 Mar 28].